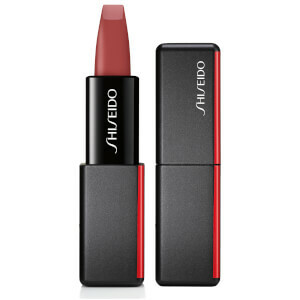 Add a flush of brilliant matte colour to your pout with the Shiseido ModernMatte Powder Lipstick; a weightless, full-coverage lipstick that lends long-lasting, velvety colour for striking lips. Enriched with a unique blend of waxes and oils that melt effortlessly onto lips and transforms into an ultra-thin, featherweight powder, the lipstick utilises spherical pigments that float across lips to blur imperfections, whilst velvet powders lend a mattified, airbrushed finish that stays put for up to 8 hours. Arriving in a vast range of shades inspired by Tokyo’s vibrant nightlife, the statement-making lipstick is designed for precision application thanks to its angularly-tipped bullet that expertly hugs the contours of the mouth. Directly glide the angular bullet across lips. Mica, Dimethicone, Neopentyl Glycol Dicaprate, Polyethylene, Diisostearyl Malate, Synthetic Fluorphlogopite, Titanium Dioxide (Ci 77891), Glyceryl Diisostearate, Red 7 (Ci 15850), Microcrystalline Wax(Cera Microcristallina/Cire Microcristalline), Triisostearin, Iron Oxides (Ci 77491), Trimethylolpropane Triethylhexanoate, Iron Oxides (Ci 77492), Iron Oxides (Ci 77499), Methicone, Aluminum Hydroxide, Tetradecene, Silica, Polysilicone-2, Tocopherol, Calcium Stearate, Simethicone, Bht, [+/-(May Contain/Peut Contenir)Red 6 (Ci 15850), Yellow 5 Lake (Ci 19140), Yellow 6 (Ci 15985), Blue 1 Lake (Ci 42090).